The End of the Rodin Reign at Rockefeller—What’s Next? 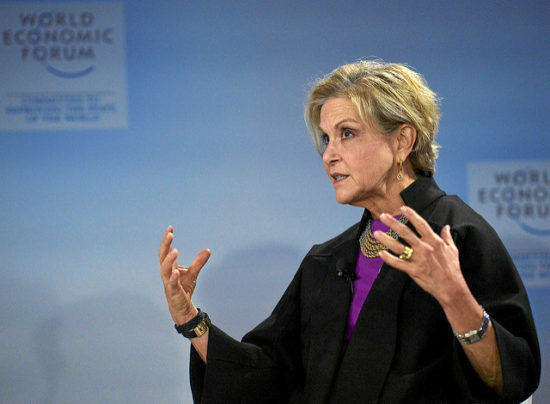 Judith Rodin’s 11 years at the Rockefeller Foundation will soon come to an end as she intends to move on. Known for her version of strategic philanthropy and “impact investing,” which attempts to mix resources from corporate, government, and philanthropic coffers toward building more sustainable systems, perhaps the signature effort under her leadership has been the “Resilient Cities” project. She emphasized brand-building and hitting shorter-term performance goals, making her a rarity in the nonprofit world. She unabashedly admits to spending more time with the foundation’s corporate partners than with its grantees. The Center for Effective Philanthropy gave the foundation low ratings for its relationship with grant recipients. Critics say she focuses too much on seeking publicity. Those critics include the site Blue Avocado, which in 2010 gave the Rockefeller Foundation one of its first satirical Just Awards for Narcissism in Philanthropy based on its “overwhelming and relentless promotion” of its president. A comparison was made of online mentions of three top foundations and their presidents: the Ford Foundation and Luis Ubinas, the Kellogg Foundation and Sterling Speirn, and of course, the Rockefeller Foundation and Judith Rodin. Looking only at mentions since 2008 (when Ubinas, the newest of the three, started his tenure at Ford) we find that, in proportion to their online mentions in general, Rockefeller promotes its president more than 12 times as often as Ford and more than 176 times as often as Kellogg. Last year, Rick Cohen wrote an article for NPQ detailing Rockefeller’s payments of more than $15 million to Doug Blade of the Teneo PR firm over three years. One of the things Blade attempted (and failed) to do, using Rodin’s support of the Clinton Foundation as a selling point, was get Rodin appointed to the President’s Global Development Council. Rodin’s position on those who would criticize her? “Philanthropy is littered with short-term success and long-term lack of sustainability,” she said. “If the markets find ways to benefit from supporting philanthropic goals because it’s good business, you really have a much higher probability of sustainability.” And, says she, the Foundation’s “bully pulpit” is thriving—“There isn’t a president or prime minister I can’t talk to,” she says. Executive transitions can result in full-scale changes in strategy and style, as we have seen at others of the country’s large foundations. It will be interesting, as we watch this search come to fruition, to see how much of Rockefeller’s recent commitments have to do with Rodin’s leadership and direction as opposed to a deep institutional commitment.